Glass panel room dividers - Does anyone know where i can purchase glass black dividers from in the UK. You'll want to find a steel fabricator that does Crittall style glazing. Try Fabco Sanctuary Ltd, or Clement Steel Windows - or Crittall themselves. Kitchen - Hi, could you share the name of the kitchen company? Cordon off the cooking areaA glass partition is a natural solution when a separation of cooking and relaxing spaces is essential. Here, it’s a framed glass version from above counter height to the apex of the striking sloping roof.Dividing this way will mean that the TV volume doesn’t have to be cranked up to cover up the sounds of extractor fan, dishwasher and running water when the space is being used for multiple activities, but the whole effect is still open. Notice how the cabinetry, partition framing and sofa are linked through colour, while the floor finish is continuous throughout for a pulled-together effect.Is it over for open-plan kitchens? 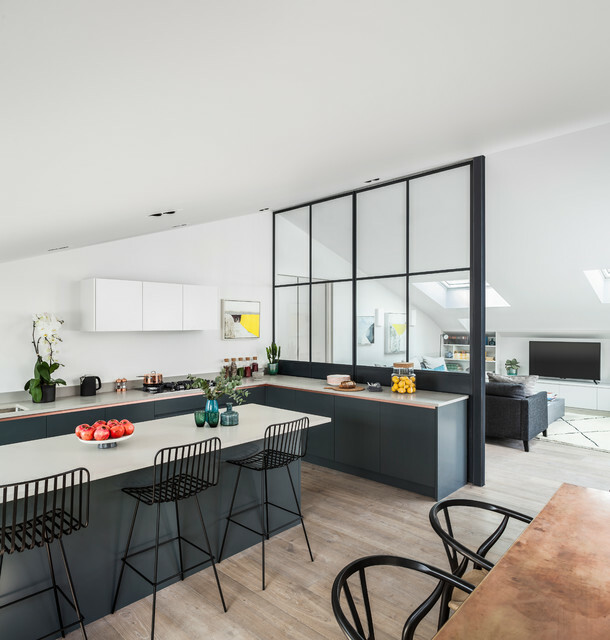 Get a glass partition wallThis is a really neat solution for sectioning off an open-plan kitchen and a living space without blocking the light flow from one side to the other. By dividing the room with glazed panels taken right up to the roof, there is a distinct division of the space but the cooking and relaxing areas still stay intrinsically linked, while none of the sense of height and space of the large room is lost, as it would be with a solid partition wall. Work in linesAdd a sculptural element to a modern kitchen with a linear design. Here, the black frames of the stools echo the lines on the window panels and dining room chairs. And it would be easy to pop on a cushion to add a little colour to the scheme.